Fluoropolymer coatings are generally ultra thin films that are applied at a few microns in thickness and cause water to de-wet on the surface due to the very low surface energy of the coating itself. 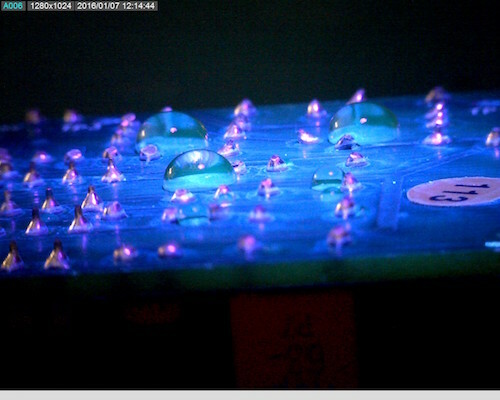 Liquid conformal coatings are applied in the range of 25-75um so they are considerably thicker in nature. There are several variations in ultra thin conformal coatings out in the market now. Two of the most popular fluoropolymer processes are liquid materials which which dry onto the substrate and materials which are applied in a partial vacuum deposition where the coating is deposited onto the surface in a gaseous state. The surface modifiers do a different job to the liquid coatings. What they do is effectively change the surface energy of the substrate they are applied to. What is critical about surface energy? The change in energy that a surfae modifier creates when applied to a circuit board makes it harder for liquids like water and oils to wet the surface and cause corrosion etc. When we consider the actual value of surface energy the surface modifier has, we are in the range of Polytetrafluoroethylene or PTFE as its better known. The best-known brand name of PTFE-based formulas is Teflon by DuPont Co., which discovered the compound. As we all know Teflon helps avoid “things” sticking or wetting to it. So, these coatings work on the same principle. The main advantage of using the surface modifiers at less than 2µm compared to the standard conformal coatings is that for this type of coating is not necessary to use masking. This is because the coating is so thin that it can be removed or rubbed away easily. For example, when the male and female connector of a circuit that is coated in a surface modifier is joined, the coating is easily scraped away, which leaves a good electrical connection. This advantage offers an interesting option for the use of surface modifiers. However, it must be realised that the liquid coatings perform better in other areas and caution has to be used. Also an important point to realise is that no coating manufacturer of surface modifiers will guarantee that you do not need to mask the connectors. The fluoropolymer coating has water and oil repellent characteristics. This can be useful to avoid water entering connectors on circuit boards. It can also make water and oil not wet the surface. The fluoropolymer coating could also give components protection underneath the devices like QFPs and BGAs and the backs of the legs due its water repellent properties.. This is traditionally a difficult thing to do with conformal coatings and is in fact discouraged under certain devices. There are possible improvements in performance by using a conformal coating and a fluoropolymer in conjunction on the circuit to benefit from the properties of both materials. What are fluoropolymer hydrophobic coatings? How does a fluoropolymer actually work?